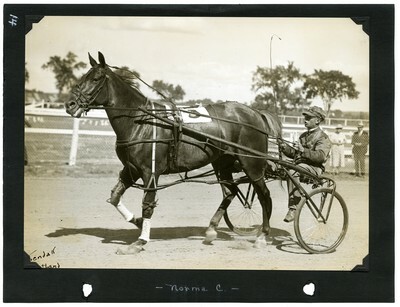 Sepia tone photograph of chestnut mare, Norma C., Rouilliard up in the backstretch of Maplewood Park following the second race of the second day of the Maine State Fair in Bangor, Maine, August 21, 1935. Norma C. finished the race in fourth place. The photograph is signed in the lower left corner by photographer Guy Kendall.